Enjoy an Unrivaled Gloss and Long-Lasting Protection... faster and easier than any traditional wax or polish!! A water-based blend of surface-enhancing ingredients and superior gloss additives, we present to you a product that will generate the highest level of appearance and protection for all your onboard solid surfaces - both interior and exterior - achieved faster and easier than any traditional wax or polish! 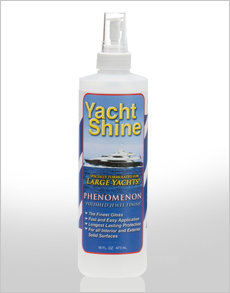 A simple light misting of the Phenomenon, spread with a clean microfiber cloth and lightly buffed dry will reveal a shine and a silky-smooth finish that you likely have not experienced.